Room temperature reduction of up to 15 degrees and savings of up to 25-30% of the cooling portion of electric energy costs can be achieved in warm climates. Did those numbers register with you? 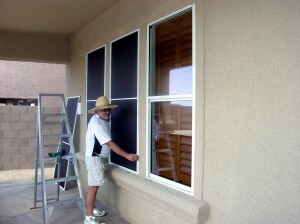 Most people can’t really understand how effective solar screens are until they get them on their windows. Then they understand. Do you have “problem rooms” that always seems to be hotter than the others? Can you can walk some rooms and feel the heat? The closer you get to the window, the more you can feel the heat on your skin? Some people even close off certain rooms because they are too hot. Solar Screens are the “Instant Cure” for these heat problems. Open your blinds and drapes to let in the light and stay cool with your windows covered by external solar screens. With Solar Screens installed, up to 80-90% of the sun’s heat and glare is reflected, absorbed and dissipated before it strikes the window. In mid-summer, as much as 230 BTUs can fall on each square foot of unprotected glass. 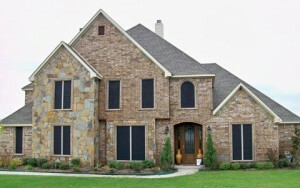 Solar Screens helps cool the home by blocking much of the heat before it reaches the glass.